We despise our weaknesses; the apostle Paul delighted in his. We hate hardships and difficulties; Paul welcomed them as friends. We beg God to remove obstacles from our lives; Paul thanked God for such opportunities to experience his power. Throughout 2 Corinthians Paul turns many of our values upside down. He teaches us that in all circumstances we can rely on God's promise; "My grace is sufficient for you". This revised Lifebuilder Bible Study features additional questions for starting group discussions and for meeting God in personal reflection, together with expanded leader's notes and an extra "Now or Later" section in each study. 2 Corinthians by Paul Stevens was published by IVP in November 2015 and is our 27301st best seller. The ISBN for 2 Corinthians is 9781785062773. 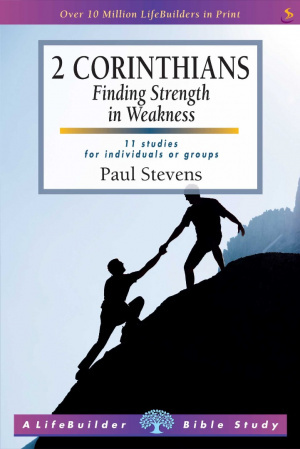 Be the first to review 2 Corinthians! Got a question? No problem! Just click here to ask us about 2 Corinthians.